Portfolios with the most consistency always stand out to me, so it makes sense that my favorite artists to work with are consistent. My least favorite… don’t know what they are. I’m always looking for new vendors. I probably spend 2–3 hours a week scoping out new profiles on Dribbble or bookmarking portfolios I want to revisit. I’m subscribed to a Slack channel called #fire, where friends share new work from talented designers I’ve never heard of. My desktop houses a growing list of artists that I want to work with, along with notes about (what I perceive to be) their strengths. And I’m not the only one; several designers on staff do this, some *cough* more meticulous than others. This is how we find and hire new illustrators and animators for editorial work at ESPN. 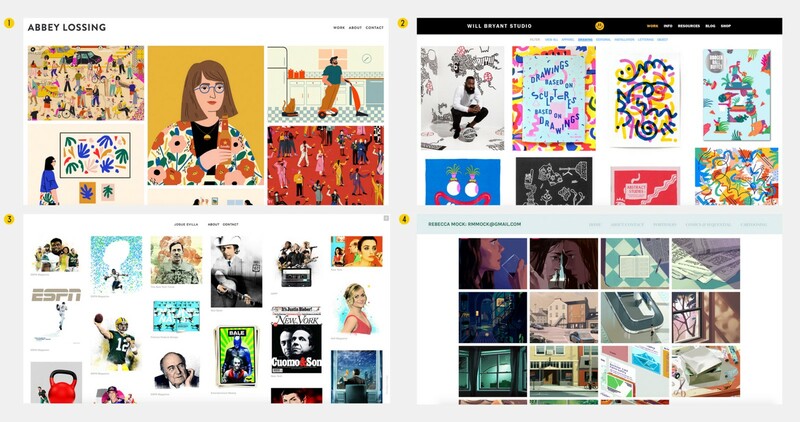 Now that I’ve been doing this for a few years, I’m noticing portfolio trends — website layout, process shots, case studies — all things that help a collection of work really stand out. It’s the less obvious trend of consistency, however, that is guaranteed to catch (and hold) my attention. To me, consistency is between 3–5 unrelated projects in a portfolio with similar form, technique or process. I usually won’t reach out to a new artist unless I see that he or she is capable of producing multiple iterations of their work in a single unique style. Consistent designers deliver predictable interpretations of unrelated subjects or conceits; their creations are both conceptually original and stylistically familiar. I’m aware words like “predictable” and “familiar” carry a lazy connotation, but I believe that in this fast-paced, same-day-turnaround, “final_FINAL.PSD” world of editorial illustration, it’s in a designer’s best interest to demonstrate that he or she is capable of delivering exactly what they advertise online. Think of consistency as proof; your designs should demonstrate that you can create within editorial restrictions, understand and communicate concept. Consistency proves you’re competent, efficient and can create more than just one of something. How is consistency different from “style”? Style can be interpreted a bunch of different ways — how you draw, a recurring character or presence, the way you hold your brush, the angle you write your letters … To me, style is simply what I recognize about your art. That studio scans old clipart and textures. This guy uses monoweight strokes in his icons. This girl draws tiny heads on giant bodies. Whereas consistency (again, to me) is the ability to replicate any specific style over and over and over again. There’s really no limit to the amount of styles you can showcase, but when I’m introduced to your portfolio, I’m gonna notice the stuff that’s consistent. If I see anything repeat itself, I’ll assume it’s your bread and butter—I’ll think that’s probably what he or she draws every day. Style is important because it gives art a voice. Consistency, I think, is even more important, because it amplifies that voice. Your style should be what makes you unique as a designer, but your consistency should be what makes you desirable as my designer. I admire style, but I require consistency. For whatever it’s worth, requiring consistency among my vendors doesn’t limit anyone to a particular style; I believe portfolios can be consistent in more than one way. 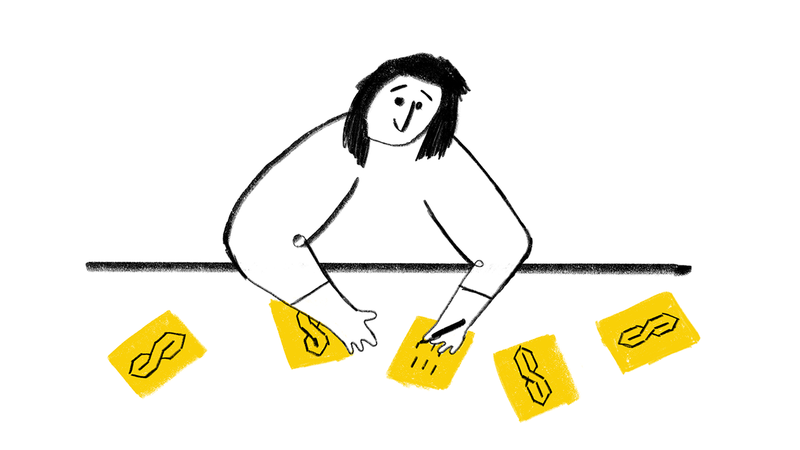 I rely on most freelancers for multiple kinds of editorial design — sometimes even crossing mediums (most animators are also great illustrators!). It’s not uncommon for us to call on the same person for completely different types of work (although, I don’t recommend exploring multiple consistencies until a single overall style has been developed). When commissioning illustration, I really value being able to point to an artist’s existing work for reference — even if it’s an amalgamation of 2–3 examples, which usually ends up sounding like a trip through the buffet line (“I dig the stroke weight of Project A and the texture from Project B, but I’m looking for something more colorful, like Project C”). I guess if style is the menu, consistency would be trusting every dish tastes right. Occasionally, a vendor will share a new style with me and ask if he or she can apply that to our next project. It’s because of their consistency — and the subsequent trust they’ve built — that I usually say yes. I love being the guinea pig in this situation because I know it’s low-risk, high-reward. If it works, we’ve just added another piece to their portfolio (progressing style), and if it doesn’t work we can always revert back to that artist’s traditional style (preserving consistency). Consistency helps build trust. It allows me to empower the designer without micromanaging or asking for updates. I can assign an illustration, approve concepts and set a final due date without ever seeing finished work. 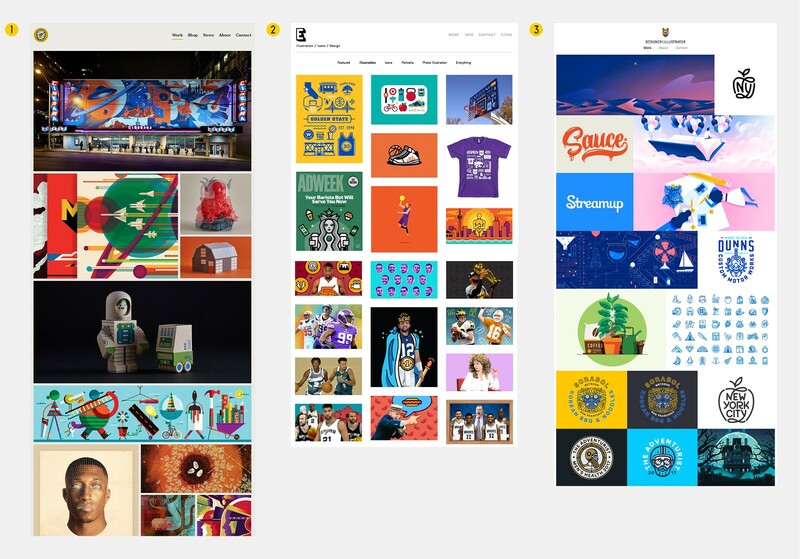 If I’m able to anticipate how the finals will look, the designer’s sketches can stay loose, even when my direction is riddled with feedback — this makes communication clearer and deadlines less imposing. The portfolios and social accounts that I tend to gloss over without much thought are the ones that seem to have an identity crisis. Maybe you really are into hand-lettering, font manipulation, textures, vectors, photography and sculpting—good for you! Exploration is important, but I shouldn’t have to sift through a scrapbook of experiments to identify what you’re best at. Throw that stuff on a blog (personal projects are perfect for developing new styles!). Your website needs enough uniformity so that I could see two completely different projects on an index page and think Yep. Definitely the same artist. Only when a new style is fleshed out and exemplified in more than one project should it be included in a portfolio. Until then: just play the hits! Personally, I struggle with consistency. I’m only just now beginning to understand my own illustration style, let alone how to keep it consistent in all my work (admittedly, I’m a terrible candidate for editorial illustration). I’m jealous of the supremely talented illustrators whose work has become so consistent their designs and brand are synonymous. I think a fundamental goal of any freelance artist should be recognition, wherein casual fans and devoted followers alike appreciate the consistency of one’s style. Of course, we’d all love to be known for our style, right? Mary Blair, Dr. Suess, Bill Watterson, Charley Harper, Paul Briggs: instantly recognizable work. But what good is a style if you can’t consistently replicate that same level of quality? In my opinion, the best designers develop and cultivate between one and three different styles. But what sets them apart is their ability to build on that style — and that’s a matter of consistency. If it came down to two potential new vendors, where one had a huge portfolio with multiple styles and the other only had a few consistent-looking projects, I’d likely choose the latter. Content Design at the world-wide leader .